We were awake a little earlier this morning, and Matt began preparing a breakfast of scrambled eggs, bacon and sausage, while Justin was trying to get the group moving. Justin’s task today was to get back home in time to take his son to his school jazz concert and he was not to be late, at least not without consequences. All of the married men reading this are nodding their heads knowingly at this moment. Anyway, he wanted to be on the trail by 7:40, which seemed to be a very precise time. Not 7:30 or 7:45 or 8:00, but 7:40. Kyle felt this was directed at him, since he would never be ready on time, so there was surely a buffer built in to the start time. Regardless, Justin, Kyle and John K. began pedaling out of camp onto the Mesabi Trail shortly after 8:00. Dennis and John lagged behind, Dennis working on the previous day’s diary and John talking and drinking coffee, seeing no need for an early start for himself; he surely was in no rush for the day! 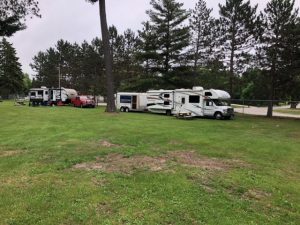 By 9:00 Matt had pulled the mother ship out of camp for a meetup in Keewatin and by 9:30 Dennis and John were on the trail. Justin, Kyle and John K. rode the 30 miles to Keewatin for an early lunch stop, after which Matt headed back to Grand Rapids to prepare for their departure. Dennis and John rode unsupported for the day, packing plenty of snacks for the 62-mile ride. 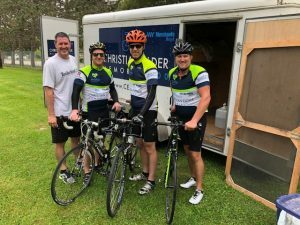 We met the lead group on their return trip from Keewatin late in the morning and we said our good-byes, knowing they would be on the road back to the Cities before we returned to camp. I really know nothing about their ride, so I thought about making up a few tales to make the day sound more interesting, but truth is stranger than fiction on the CEM, so I couldn’t really come up with a good story. I do know that the boys did not appreciate a couple of the 8 degree climbs, particularly on either side of the floating bridge near Taconite, and also that Kyle’s biking app will tell him that he climbed more than he descended, even if he started and ended in the same place. I need to find out which app he is using! 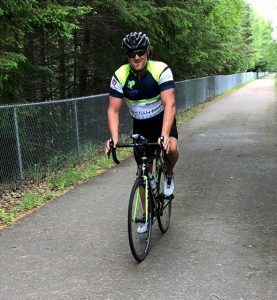 Meanwhile, John and Dennis continued separately along the trail, each stopping at the Sinclair station in Keewatin to refuel, Dennis opting for Gatorade and John choosing a shrink-wrapped gas station ham sandwich. Yum!! On the return trip Dennis got the first flat of the ride, some sort of thorn leaving a noticeable divot in the tire. He was concerned enough about the breach in the tire to insert a folded dollar bill between the tire and tube for reinforcement, an old trick learned years ago from John. The CO2 cartridge would not fully fill the tube, however, and he rode the last 20 miles with 50 psi in the back tire, less than half of normal. Although the repair job was suspect, it held for the remainder of the ride. John and Dennis were greeted back at the campground by part of the new crew, Kathy, Ann and Sherry. 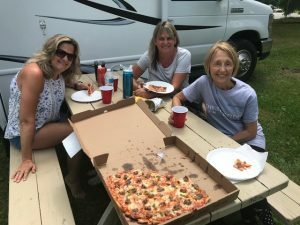 Apparently there was no food left in the RV, which seems a bit beyond belief, so they ordered a pizza to be delivered right to the campground. This pizza was much better than the fine dining experience and certainly better than the gas station sandwich, so John and Dennis had no complaints. We relaxed for the remainder of the afternoon and evening until Doug and Brian showed up with Doug and Ann’s brand new camper. We also heard word from Justin that they were well on their way home, even taking time to stop at DQ to fully utilize the gift card from Kids ‘n Kinship. After setting up our second campsite, we grilled chicken thighs, and Ann made a spectacular risotto and Caesar salad for dinner. It was late, and we decided to call it a night, even as John continued to give us updates on the Twins game. Tomorrow we move to the Central Lakes area.